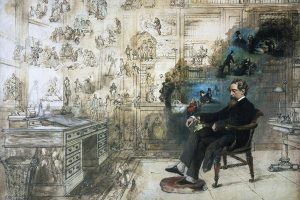 Charles Dickens hit Glasgow six times between 1847 and 1869, first to open the Athenaeum (an early FE college), then as actor/manager with a London troupe of amateurs but more significantly in four hugely successful personal appearances reading from his own works. It is hard now to grasp how very very popular he was as writer and performer. From the readings he himself selected and with the help of two experienced actors we will try to recover something of his impact on Glasgow. Mulled wine and mince pies will be served during the interval. Born into the cinema business he naturally wanted to be a film director, but easier said than done! Eventually he succumbed to his father’s pleas and, after being a member of the Oxford University Dramatic Society and studio manager for Granada Television in Manchester, came home to Glasgow in 1962. Enjoyed running the Cosmo (now the GFT) for ten years. Past member of Glasgow University Drama Society, Arts Theatre Group and Kilmardinny Theatre Group. Tony has been involved with broadcasting throughout his career – and even before that when he set up a radio station in the attic of his parents’ house. He is now Announcer-Director for BBC Scotland in Glasgow and his was the first voice on Radio Clyde, the first commercial radio station outside London.